I rummage through my closet looking for an appropriate outfit, not an easy thing for a girl who spends her life in gym clothes and sneakers. 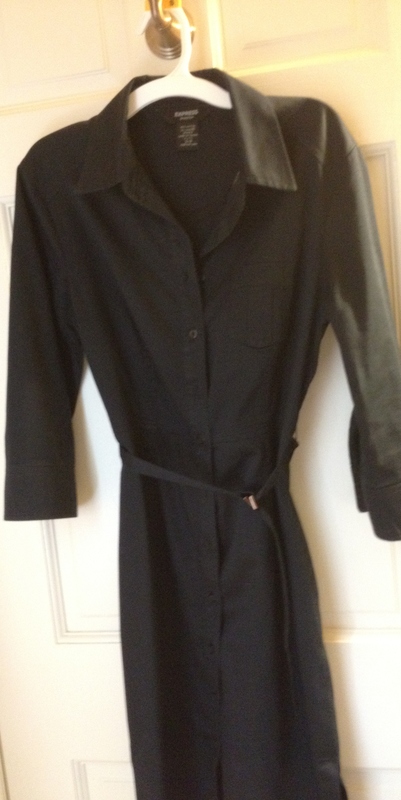 I try on at least three different ensembles, but ultimately settle on a 15 year-old black dress that I have worn for pretty much everything from bridal showers to funerals. Today, it’s my fall-back temple dress. Thank goodness for Express in the 90’s. Shalom! School has begun. Fall is almost here. I am Jewish. Of course I’m Jewish all year round, but in September we celebrate the high holidays – Rosh Hashanah and Yom Kippur. On Rosh Hashanah, we reflect on the past year, and on Yom Kippur our fate is sealed. Simply put, it’s finals week and report cards are coming. 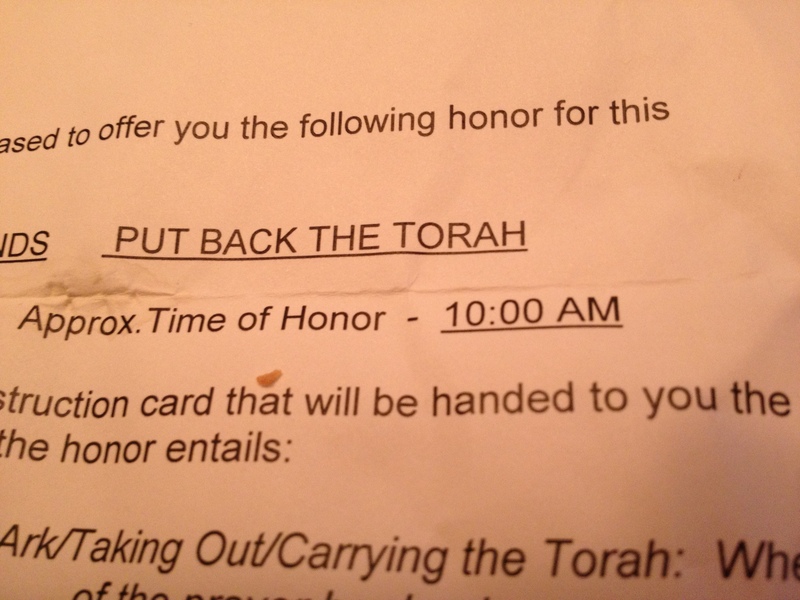 Today, I’m supposed to be at the temple by 10am because I’ve been given an honor to open the ark encasing the Torah. It’s nice to be acknowledged, but I’m really no good at the religion stuff. I mean, I send my boys to Hebrew School, attend temple on the holidays and of course, wear my “I heart Jews” tee shirt (kidding); but I can’t read Hebrew, never was a Bat Mitzvah, and feel generally uncomfortable with all things religious. I once said “Jesus Christ” as I tripped into temple and practically fell into the Rabbi. Apparently, I am capable of offending multiple religions simultaneously. I also have said “Amen” to the Rabbi after he sneezed, and once in my flirty, uncomfortable-with-authority awkwardness, suggested to him that the reason it was hot in the temple was because of me. Oh yes I did. I can’t imagine why they would put me up there on display, and I’m conflicted about why I even accepted. I don’t really want to go, but all I can do now is accept my honor, hopefully not fall off the stage, and then slip quietly into background, which is where I really wanted to be in the first place. I glance at the clock. 9:45am. Crap. Howard and the boys will just have to meet me. It’s a seven minute walk, but I’m in heels so it’s more like 10 minutes. I start with a brisk pace, but slow down when I trip over the sidewalk and slightly twist my ankle. At 9:58am, I limp into the temple sanctuary and check in. “I made it!” I announce and the administrator hands me a card that says my time is 11:15am. What?? My paper said 10am. I show it to the administrator and he shrugs. What kind of racket is this? I grab a prayer book and sit down in a semi-breathless huff. I notice the book is new and remember that the temple purchased new books a month or so ago, and that in a moment of sentimentality I had even donated $54 for one of the books to be dedicated to my grandmother who had recently passed. I flip it open absently and there it is; my grandmother’s inscription. Out of 300 random books, I find my grandmother. Or more accurately, my grandmother finds me. I smile and look around like she’s just placed the book on my chair, but of course, it’s our secret. The temple president is speaking, and I’m instructed to wait for her to finish before ascending the Bimah (platform). Her running theme is “Hineni” which translates to “Here I am.” She’s trying to inspire people get involved, while thanking the people who do. Hineni. I like it. She finishes and up I go with a handful of other honorees. I open the ark, the Torah is brought forth, and we are instructed to follow the procession around the congregation. What? Me? No. I didn’t sign up for that. Open. Close. Done. But I’m ushered forward and immediately overwhelmed with people shaking my hand and offering Shana Tova. Like writing LOL, I have never been comfortable saying Shana Tova. It always felt like I was pretending to be something I’m not. Happy New Year I can say, but here I am clasping hands with dozens of people and Shana Tova’ing like a game show host. We finally end the procession back on the Bimah. 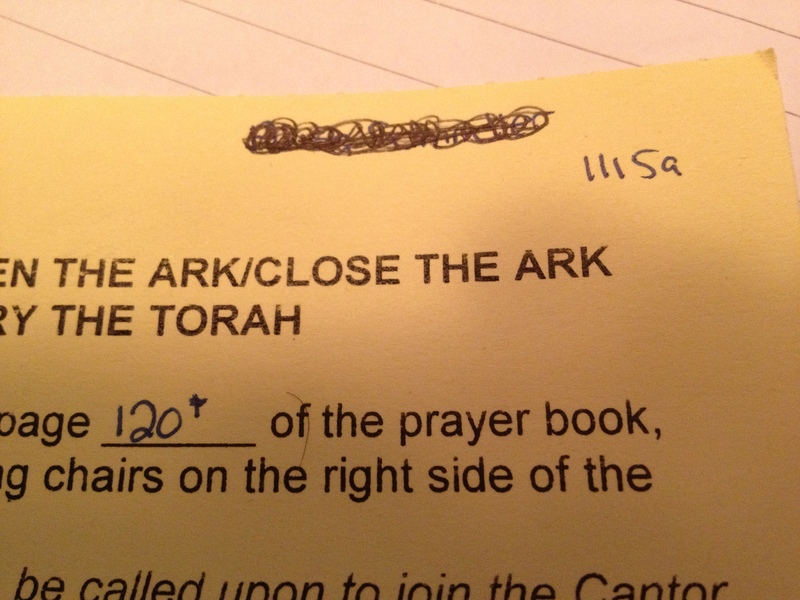 The Torah is put away and the arc closed. I look out from the stage and see my boys, front and center watching me. Julius is dancing a little dance, Michael is bright-eyed and Tyler is smiling wide. I smile back and realize his fly is open. Oops, I think. Hineni. I return to my seat, flushed and happy to be done. Howard and the boys are there and together we finish out the service. I look around at the congregation and see so many friends and familiar faces. My prayer book with my grandmother’s inscription rests on my lap. I feel warm and connected. Hineni. Here I am. Posted in Being Jewish, Every Day Scoops and tagged family, Happy new year, holidays, humor, Jewish, Jewish new year, not religious, Rabbi, Rosh Hashanah, Shana Tova. Bookmark the permalink. I am sure, you made your boys and grandma proud – you are super-lovely! feel the same way about shana tova or l’shana. what’s the difference? I am I a bad Jew? What a crazy coincidence finding your grandmother’s book! And saying hineni after realizing your son’s fly is open is priceless!! it was so freaky… i doubt i’ll never see it again. I love that picked your grandma’s book! What are the odds. Very cool. A pleasure to read. Thank you. You see me waving from over here? Hineni! I loved your description of past encounters with the rabbi. Hysterical! It was sweet that going back with your husband and children — and your grandmother’s obvious blessing — made you feel as if you finally belonged. you too!!! and thank you!! so much of a better week, but i still have a miserable post coming from last…. Absolutely beautiful. What an amazing way to start the new year. Getting your grandma’s book??? Amazing! Loooooved it! As usual you made me laugh, think, reflect and feel. Wonderful. i couldn’t believe it! My grandma really was a witch. I love it. I wish she’d check in more often. I don’t know if i’ll ever see that book again. It made for a good start to the new year. I used to be Catholic, but I gave it up for Lent. nice. what will you give up this year? I’ve never been religious, but if I was, I would probably be Jewish. I would probably be a gouty old man, with a mouth full of corned beef and figs. Mmmmm, bagels. i 100% agree. i just wish i took a picture of the book, cause i don’t know if i’ll ever see it again. I laughed and cried at this one. WOW, LOVE, LOVE this post. And, by the way, you looked Tres Chic in the 15 year old dress! Thank you!!!! I so appreciate you saying so. How totally cool that you got your grandmother’s prayer book! And I love the philosophy “Here I am.” So simple and elegant, stark yet welcoming, too. wow that’s so crazy about picking up your grandmother’s book! absolutely LOVE the ending of this piece. I always got a lovely little chill when I picked up one of the books that one of my grandparents donated to our synagogue when I was younger. I felt like maybe it wasnt such a coincidence. 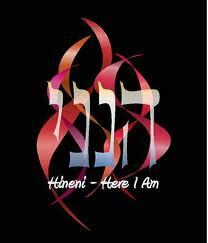 Also, Hineni is one of my favorite words in the Rosh Hashanah service. I think sometimes just saying “I Am Here” can be so powerful. I’m agnostic, my husband is Christian, and for several years, we sent our daughter to a Jewish preschool, because practically every preschool was SOME religion, an Judaism was the only one I could feel confident about. I knew that she would be taught to be herself because there was nobody else to be, but I feared that at a Christian preschool, she might be instructed to follow the herd, when I’m pretty sure she’s as incapable of doing so as I am. And Caroline went, “Baruch atah Adonai elohaynu melech ha’olam boray pri ha’gafen”. She had a four year old’s translation that went with it. Scott’s family was really impressed. Really stunned, but really impressed. But that was the blessing they used every day at lunch, so she just repeated it. Wait — I am being corrected. The prayer (which I obviously only know the first three words of) that I pasted above is actually the one for blessing wine. She had the food one, promise. but you know, my boys went/go to a jewish nursery and every thursday/friday they do a “shabbat” where they drink grape juice and eat challah and do the prayers for wine and bread… so she probably did learn that one as well. omg – i love that story!!! it’s amazing what sticks with the kiddies. and to hear it coming from her mouth! that’s a beautiful moment! This was such an engaging story and I know very little about the Jewish faith, I’m afraid. You had me smiling through out and especially “in my flirty, uncomfortable-with-authority awkwardness, suggested to him that the reason it was hot in the temple was because of me.” My favorite part was the meant to happen grabbing of the prayer book dedicated to your grandmother. You were supposed to be there!!! That’s how I look at those sorts of things. I don’t LOL in black and white (because I also feel like I’m trying to be someone I’m not), but I TOTALLY LOLED (which translates to laughed out louded?). I expected to suffer through this as soon as I realized it was religious-themed–but it was SO lovely to read. You are here, alright! I love this piece – funny, irreverent and wise all at once. The moments you described had me laughing out loud (esp your son’s fly issue and the “Jesus Christ” tourette moment)! Great writing, engaging story – well done! Here I am, indeed. Your grandmother, you, and your son’s …umm…your family. Lovely post. Holy crap is that a fantastic line. I’m envious and I think I hate you. well, now i think i love you – so there! This: I once said “Jesus Christ” as I tripped into temple and practically fell into the Rabbi. This is why I love you so. And I love writing about religion– this is a good one. So many gems here. thank you so much! religion is tricky but so full of interesting/fascinating stuff..
sadly i have a list of awkward rabbi moments. poor nice man who has to deal with the likes of me. I love getting glimpses into worlds I don’t know much about. This was wonderfully detailed, and I loved the emotional touches, like your grandmother’s book. Really lovely. This struck a perfect balance of funny and heartwarming. It was really interesting to read, and I enjoyed it a lot. Great job this week! next week maybe i’ll show you my dark side. that was some day for me… so stressed, but funny. and then i found my grandmother’s name… it all just came together somehow. i was supposed to be there. she was there. we were there. and i stood up and did my thing. here i am. thanks for reading.